Maovember went mental mid-week as Q Mex held its third annual charity quiz on November 9. With quiz masters Jay and Reece at the helm, a full house of teams competed in six rounds of brain-teasers and raised money from entry fees, a draw for rmb500, rmb200 and rmb100 Q Mex gift certificates, and frozen margaritas. Our team, Maovember Reign, held second spot until one wrong answer in the final round cost us victory. Didn’t matter as the drinks, half-price nachos and draw made it a most excellent night. 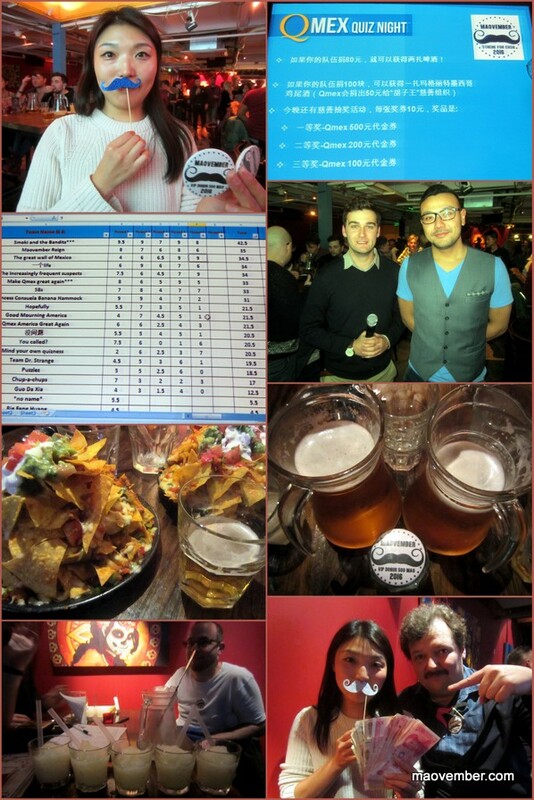 Thanks to Q Mex manager Lucy Li for hosting an event that raised rmb2139, including rmb1000 from the raffle and rmb1139 from entry fees, drinks and donations! Secret sipping | Mystery Wine Party returns!